This completed form, a “minimum” of three photos, copy of registration papers, and a breeding contract must be received no later than December 31, 2018. Send as many photos as you like. Photos sent by e-mail must be high resolution (minimum 300 dpi) color jpg or pdf files. I agree to donate the service listed below to the 2019 MHAO Stallion Service Auction. Auction is open from January 1 thru March 9, 2019. 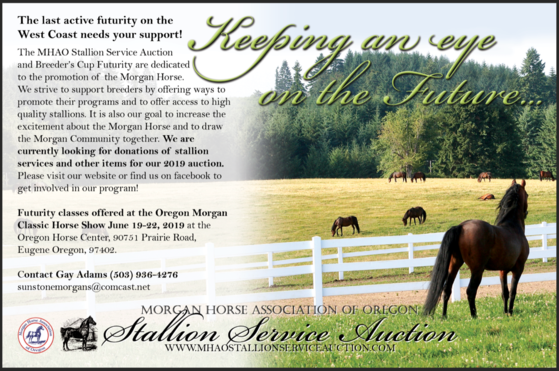 Note: Successful bidders will be required to sign your stallion service contract. Include Leasee information if appropriate. Please include on a separate sheet. Please email or mail several written paragraphs about your stallion & include with this form.